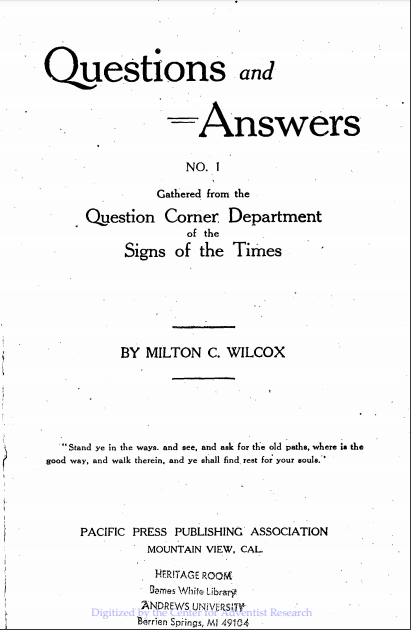 As the title suggests, the book, “Questions and Answers No 1” published in 1911, contains a total of 270 questions “Gathered from the Question Corner of the Department of the Signs of the Time” and answers them accordingly, authored by M.C. Wilcox. Below is an excerpt taken from pages 180 to 182, with questions #186 and #187 dealing with the subject of the Holy Spirit. There is a tract in circulation here teaching that Gabriel is the Holy Ghost. Will you please tell us through the Question Corner what the Holy Ghost is? First, the better term altogether, it seems to us, is the “Holy Spirit.” So the American Standard Revised Version throughout. Some have been confused on account of the different rendering of the same Greek word, supposing that the Holy Spirit was one thing, and the Holy Ghost another; but the same word translated “Spirit” is the word translated “Ghost,” and “Holy Spirit” is the better term. HIS Spirit. It is the Spirit that gives the message; Gabriel is the messenger that bears the message. As to the children of men, God baptizes men and fills them with HIS Spirit, to bear HIS Spirit-sent messages; but the messenger is not the Spirit, even tho he bears the message of the Spirit. THE SPIRIT, THEREFORE, IS THAT ELEMENT IN THE GODHEAD WHICH CARRIES THE PRESENCE AND POWER OF GOD TO ALL THE PARTS OF HIS UNIVERSE, and especially to those who have faith in God. IT IS THE LIFE OF GOD-THE POWER OF GOD. Let us not try to define God or the Godhead too closely. Let us be content to know the GREAT THREEFOLD MANIFESTATION OF DEITY; to know that the great Jehovah is our Father; that Christ Jesus, His only-begotten Son, is our Saviour and elder Brother; and that the Holy Spirit is our regenerator and the constant companion of every soul who believes in Christ Jesus. WE ARE TOLD TO PRAY TO THE FATHER AND PRAY TO THE SON, BUT WE HAVE NOTHING IN SCRIPTURE REGARDING PRAYERS TO THE SPIRIT; BUT WE CAN PRAY TO THE FATHER OR THE SON, and He will send the Spirit, and is more willing to it than earthly parents are to give good gifts to their children. 187. The Holy Spirit and Ministering Spirits What is the difference between the Holy Spirit and the ministering spirits (angels), or are they the same? and revealing Him to those in harmony with His law. THUS THE SPIRIT IS PERSONIFIED IN CHRIST AND GOD, BUT NEVER REVEALED AS A SEPARATE PERSON. NEVER ARE WE TOLD TO PRAY TO THE SPIRIT; BUT TO GOD FOR THE SPIRIT. NEVER DO WE FIND IN THE SCRIPTURES PRAYERS TO THE SPIRIT, BUT FOR THE SPIRIT. THE SPIRIT IS THE CREATIVE POWER OF GOD by which angels and all other creatures came into existence. God fills them with HIS Spirit, HIS LIFE, AND MAKES THEM MINISTERS OF HIS LIFE AND POWER TO OTHERS, ESPECIALLY TO HIS PEOPLE. He takes His consecrated people and makes them also ministers of His blessing to mankind. The angels are no more the Spirit of God than are His people. God is love. He is constantly by His Spirit sending forth the blessings of life. But He will not alone send one blessing out to the world; He wants others associated with Him in the joy of giving. Hence He uses angels and men for all His work in the world.